Étape dans le luxe dans cette oasis spectaculaire, à quelques pas d'un tronçon pittoresque de plage dans la prestigieuse communauté de Puerto Los Cabos. Judicieusement nommé, Villa Tranquiliad vous entoure avec une atmosphère de détente raffiné, offrant une multitude de services haut de gamme pour compléter la mer magnifique de vues Cortez et le bruit apaisant des vagues. Bien aménagées et décorées avec soin, cette magnifique villa dispose d'un intérieur spacieux avec suites somptueuses chambres, les plafonds avec poutres apparentes, travertin et des comptoirs en granit, et un espace de vie expansive ouverture à une terrasse panoramique incroyablement. 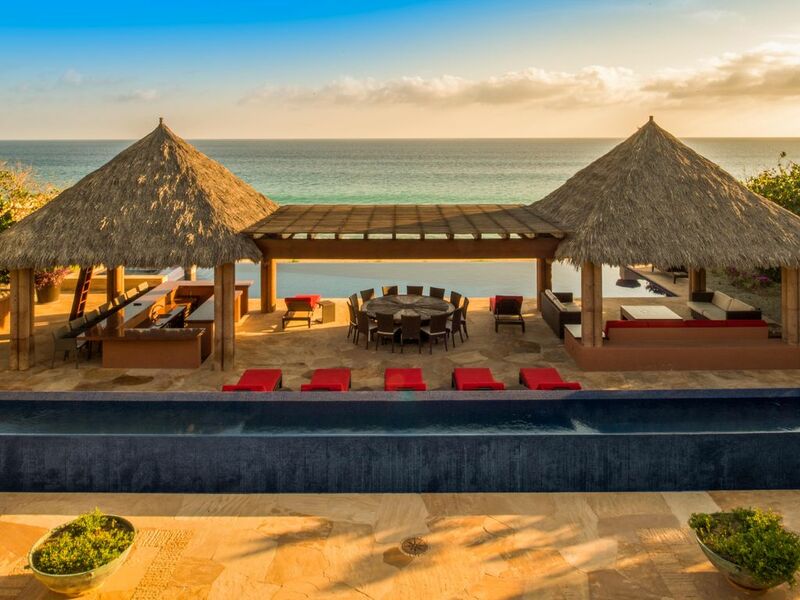 Sortez et vous êtes accueilli avec des patios palapa-ombragée, d'un agréable à manger extérieure, une piscine en bord de mer piscine, un grand jacuzzi, système de divertissement en plein air et bien plus encore. Prêt à voir les curiosités? Cette magnifique villa de vacances est juste un court trajet en voiture au cœur historique de San Jose del Cabo, offrant un restaurant gastronomique, des galeries d'art et boutiques pittoresques. golf de classe mondiale, mais si minutes. Que vous planifiez une fête une fois dans une vie ou des vacances en famille pour rivaliser avec tous les autres, la Villa Tranquilidad met en scène la romance, de détente et de loisirs. En réservant cette villa avec nous, vous obtiendrez une valeur de 900 $ en suppléments GRATUITS, une bière et de l'eau gratuites (24 ch), un service de majordome / barman d'une heure à votre arrivée, une bouteille GRATUITE de tequila premium, un transfert gratuit à l'arrivée (10 personnes maximum) , demandez-nous plus de détails), choix de crédits Cabo Expeditions de 400 $ valable pour les activités OU 1 transfert aller-retour GRATUIT (maximum de 10 personnes, demandez-nous plus de détails), jetons GRATUITS, salsa fresca, guacamole et margaritas à votre arrivée, livraison villa GRATUITE de votre AVIS location de voitures, services GRATUITS d'arrivée à l'aéroport et aux villas, service client GRATUIT 24 heures sur 24, un concierge local dédié pendant votre séjour, garantie du meilleur prix! Certaines restrictions s'appliquent. Demandez-nous pour plus de détails. AMAZING 50TH BIRTHDAY AT VILLA TRANQUILIDAD! I booked Villa Tranquilidad for my 50th birthday to celebrate with 11 of my dear friends. From the minute of arrival - and we were 12 hrs late arriving -Rosenburg and his wife were there at midnight to meet us and welcome us to this beautiful villa. The pictures do not do it justice. This is one of the best Villas I have rented in all my travels around the world. Everyone was able to have their own space but still hang out around the pool and fire pits every day as one large group. The pool overlooking the ocean appeared at times to just be part of the ocean itself. With Rosenburg and his wife and staff every thing went seamlessly. Food that they prepared was delicious and if anyone had any dietary restrictions or requests, they made it all happen easily! From our breakfasts each morning to our late afternoon lunches prepared by the staff and were able to sit by the pool and enjoy the beautiful surrounding and views. The community that this Villa is located in was beautiful and had a wonderful golf course and more courses being built. I would highly recommend this Villa to anyone looking for a beautiful setting, outstanding service, great local golf just seconds away, seamless service from a wonderful staff that makes your every request happen. I know we plan to return again in the near future! We are delighted to hear you had a wonderful birthday at Villa Tranquilidad! The service you receive at this home will exceed your expectations. We hope to welcome you back to Los Cabos soon! We had a wonderful time at this property. Beautiful setting with a wonderful staff. We recommend! Hello Angie, thank you for your review! We are excited to hear that Villa Tranquilidad is now your favorite property! This home certainly is amazing and has great amenities! We look forward to welcoming you back in the future! The long 4-day weekend at Villa Tranquilidad truly was perfection that far exceeded our expectations -- and our expectations were high! From the moment the villa caretaker Rosemberg opened the door to the grand entrance and we walked down the stairs to be welcomed with flowing margaritas and phenomenal ocean views, to the absolutely outstanding meals, to the magical huge firepit that drew us in every single night, it was a vacation that all of us will remember for a lifetime. The Villa could not have been a more perfectly situated property to host a celebration. We had 13 guests, and every single person was blown away by not only the fantastic suites, pool/hot tub and immediate access to the beach, but by the fantastic service by Rosemberg and his staff. We knew that he'd be cooking our meals, but had no idea that he'd be there the entire time waiting to help out in any way he could. Want the bar set up at the pool?....done. Want a BBQ dinner outside?...done. Just want a cold bottle of water?...done. Yet he never felt obtrusive! He and his wife Patty thought of everything a step before we did, but we often didn't see all the work that went into it...just the amazing results. In addition, Julie Byrd and her team at Cabovillas.com went above and beyond to help arrange all the details of this once in a lifetime celebration. Julie truly is the "Cabo Queen" and knows all the restaurant owners and service providers in Cabo. When you organize a large group celebration or family reunion, etc., you will want to know you are dealing with the person and company who has the contacts - not a middle man. Julie and her team were just fantastic, from the very first phone call I made to inquire about the villa to the surprise triple leche cake and mariachi band she secretly organized with my husband! Everything went off without a hitch, and every single person was wow'ed and just blissed out happy the entire time! Oh, and the whales had arrived for the season during our stay -- we honestly saw them all day long! Whale tail delight! Truly a spectacular stay at Villa Tranquilidad! Hello and thank you for your review! We are excited to hear that your group had a wonderful stay at Villa Tranquilidad! This home is special and certainly has so much to offer from its amenities to its amazing views! Our visit to Casa Tranquilidad was nothing short of amazing. The home is bright, beautiful and spacious. We spent 90% of our time outdoors, near the pool and beach. The view is breathtaking (we took many photos!) The staff was amazing as well. Lissandro was a phenomenal cook, we ate 3 large meals a day and each one was better than the next. Our rooms were cleaned each day so our beds were freshened up by the time we crawled in for afternoon naps. We absolutely loved our stay and would recommend Casa Traquilidad to anyone looking for a relaxing vacation. Hello, we agree - Villa Tranquilidad IS bright, beautiful and spacious! This home certainly is special and we are glad that you enjoyed your stay! We look forward to welcoming you back in the future! We rented two houses in Puerto los Cabos to accommodate 24 people for my husbands 50th birthday! No small feet to get 24 people, many of whom had never been to Mexico, all moving in the right direction and perfectly happy with everything from accommodations to food, to fun and transportation! From the minute I started working with CaboVillas and our Cabo Specialist Eve the experience was everything one would expect from a luxury villa company! Eve helped us with all the arrangements for travel, catering and special requests! She really listened to what we wanted and kept our budget in check. Villa Tranquilidad and Villa Estero were the two homes we rented. Each is unique and utterly amazing! The bedrooms are very spacious and comfortable. plenty of space to spread out even with a full house. Everything you will need for your stay is there at the home. In Villa Tranquilidad you will have the pleasure of meeting Rosemberg and his wife Patty who are the onsite and tend to your every need from happy hour snacks and cocktails to laundry and housekeeping to a last minute dinner by the pool and if you need anything from the store.....Rosemberg is your guy!!!! Our stay in these amazing homes would have been fabulous anyway based on location and good people but Rosemberg and his level of service pushed it over the edge and left everyone wanting to take him home with us! There amazing hospitality made the trip and was secondary only to the breath taking view of the ocean at sunset from the pool and hot tubs! We would highly recommend both of these properties! And we will be back to rent from Cabovillas and Eve again ASAP!!! Hello and thank you for your amazing review! We are THRILLED to hear that your group had a wonderful stay at Villa Tranquilidad! This home certainly is very spacious and comfortable! We look forward to welcoming you back!